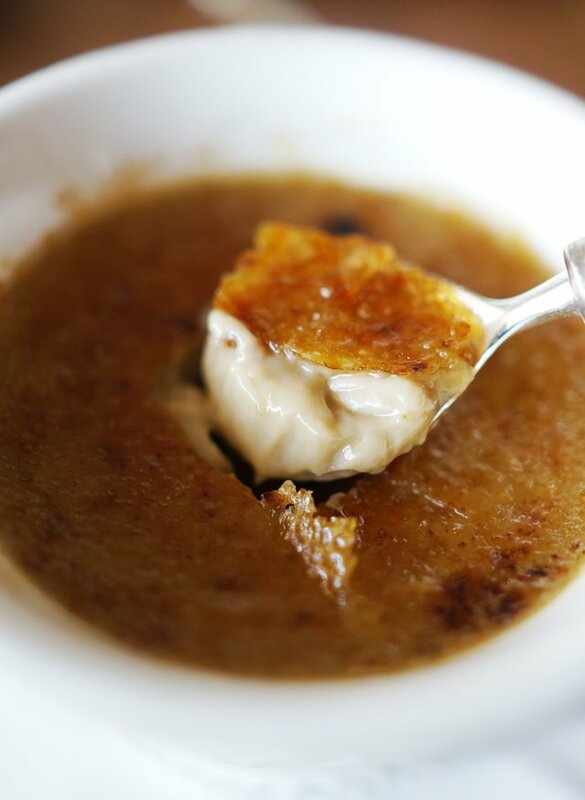 Crème brûlée is one of the simplest, yet most impressive desserts you can make. It only involves a few ingredients, most of which you probably already have in your pantry like eggs, sugar, and cream. 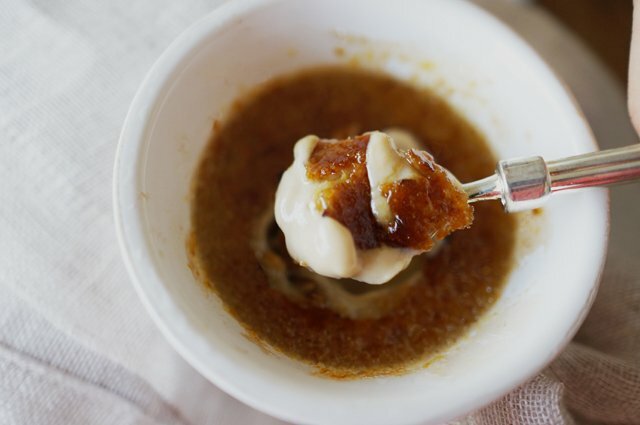 But instead of keeping with the common vanilla, I infused the custard with Earl Grey tea, which transformed the ordinary crème brûlée into a unique custard that is silky and fragrant. Its sweet aroma is intoxicating — all thanks to the bergamot, a type of citrus that is infused in the tea. And then there’s my favorite part, the thin glassy layer of caramelized sugar that is oh-so-satisfying to crack. Trust me, your guests will be impressed! Crack the top with a spoon . . .
. . . and indulge! 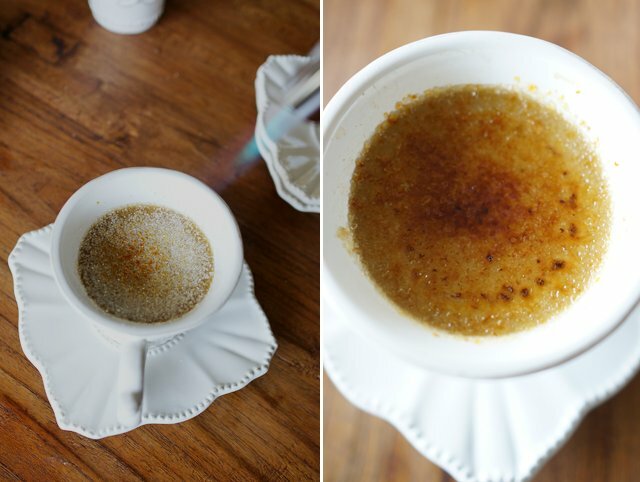 A fragrant twist on the classic crème brûlée. Preheat the oven with the rack in the middle to 325 degrees. Wrap the tea leaves in cheese cloth. Pour the cream into a small pot and heat over medium high heat, stirring occasionally, until scalding-- just when the edge starts to bubble. Remove from the heat and steep tea for about 5 minutes. 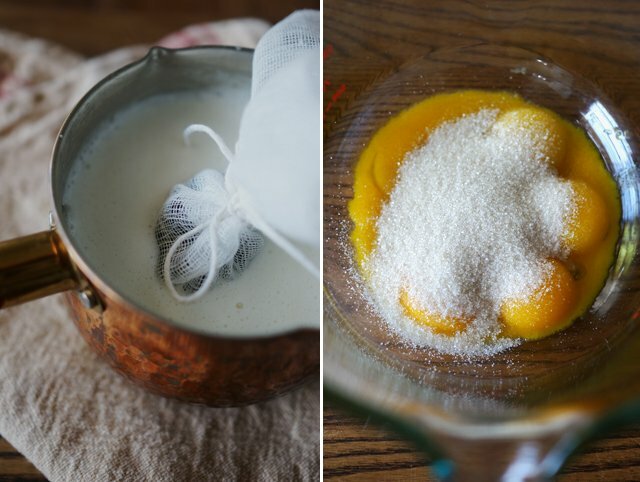 Meanwhile, mix the egg yolks and the sugar and whisk vigorously until thickened. I like to do this in a large spouted bowl because it is easier to later pour into ramekins or tea cups. 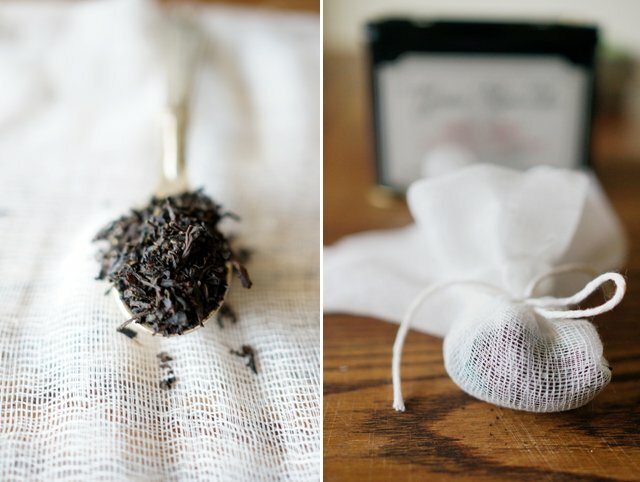 Using the back of a spoon, gently squeeze the satchel of tea against the edge of the pot to extract more tea flavor. Let the cream cool a bit, and then slowly pour the cream into the egg mixture while whisking constantly until you have a thickened custard. Line a baking dish with a kitchen towel and place your ramekins or tea cups inside. Here, I had to use a deeper baking dish since my tea cups are taller than a normal ramekin. 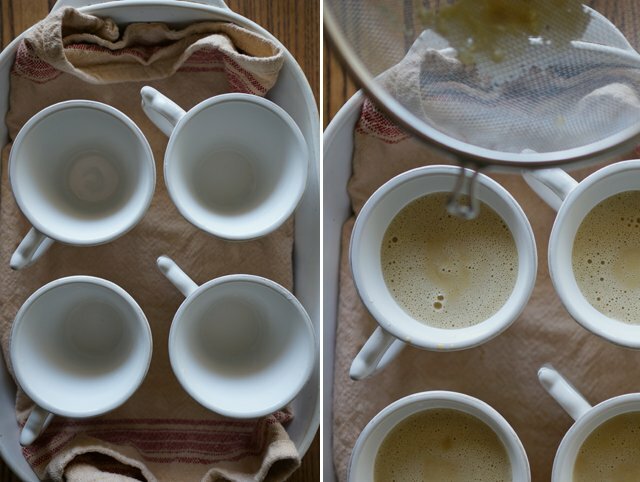 Pour an even amount of the custard in each cup through a fine-mesh sieve. 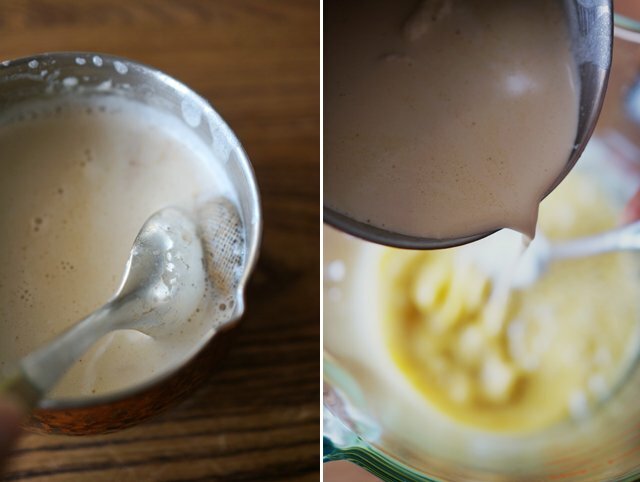 Skim the tops of the custard with a spoon, removing any bubbles. Pour hot water into the baking dish until it reaches about halfway up the tea cup. Tent the baking dish with foil and place in the oven. Bake for about 20-25 minutes, or until the center jiggles slightly when you shake the cup. Mine took an extra 15 minutes in the oven because my cups were pretty deep. 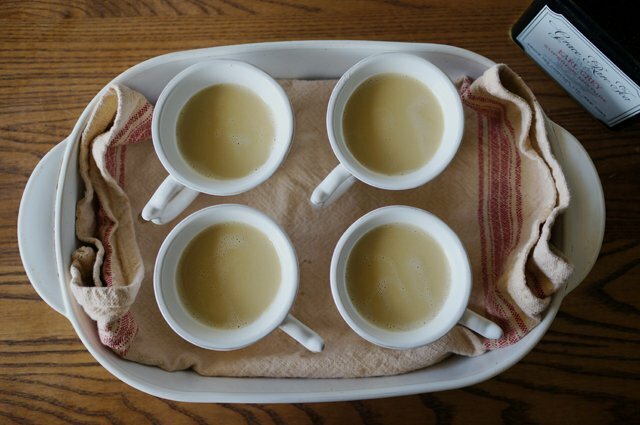 Let the custard cool and then wrap each tea cup tightly with plastic wrap and place in the refrigerator for at least 3 hours up to overnight. When your creme brulees are ready for torching, lightly pat the tops of the brulees with a paper towel to remove excess moisture. 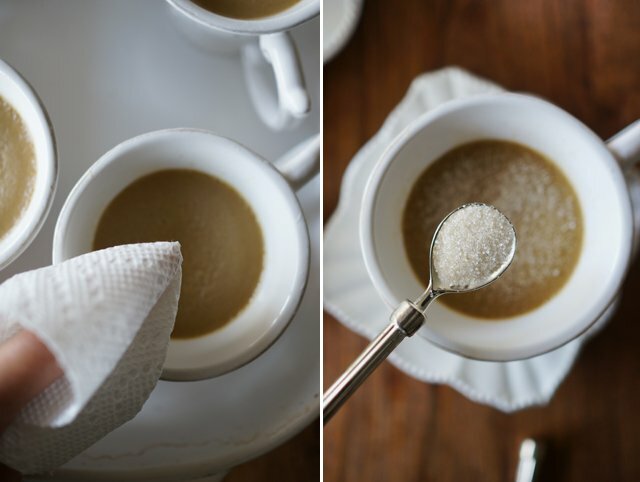 Moisture can prevent the sugar from hardening. Evenly sprinkle a small spoonful of sugar across the custard. Using a kitchen torch, caramelize the sugar. Alternatively, you can place them under the broiler, about 4 inches away from the heat, for a couple minutes. Keep an eye on the heat because sugar can burn quickly! Absolutely delicious appearance! We enjoy our tea tremendously! Thank you for this fabulous demonstration! We are definitely creating this master piece at this years celebrations! This will be my first time baking crème brulee! If we successful with your recipe, next time we are going to try using the French earl grey style tea and then lavender lady grey style tea! Wish us luck! Goodness – these look and sound amazing! Earl Grey tea is one of my favorites. 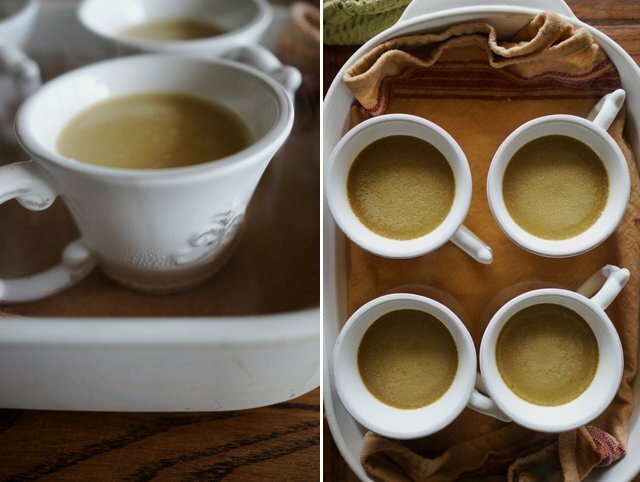 I once had a memorable green tea creme brulee and now I see this and I have a feeling this would be right up there. I love the presentation in the tea cups! Are you sure 3 teaspoons is equivalent to two teabags because when I did the math it was more like 7-8 teabags is about 3 teaspoons. Tea bags are not consistent in measurements so if you can use loose leaf tea and measure by teaspoon that would be most accurate! What temperature did you put the oven on to bake? :O I have those same tea cups – they’re lovely but I rarely get to use them (I drink my earl grey from a Harry Potter mug). 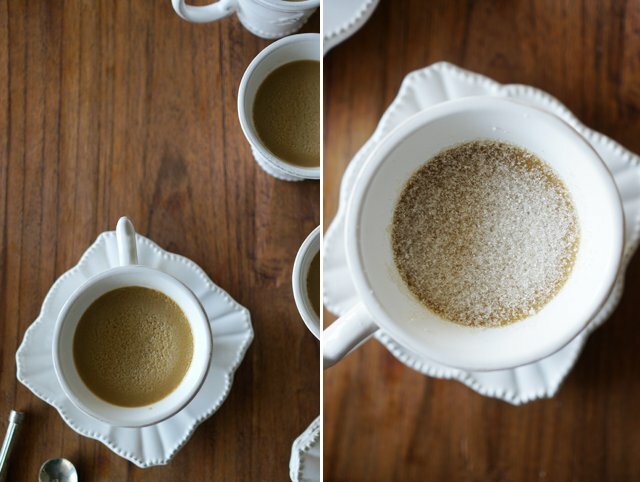 This is a fantastic idea – and now I know the tea cups are oven proof!! This looks so delicious! But I am IN LOVE with your teacups. Where did you get them? Thanks I got them recently at Anthropologie! 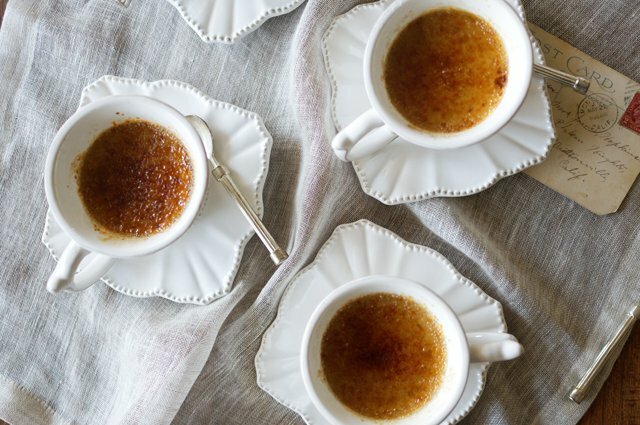 Your creme brulee looks so delicious and your photos are absolutely gorgeous! Hey Karen & HY team! I am so excited to try this! Earl Grey is my favorite tea!! Just a couple of questions: At what point did you put the satchel of tea into the cream? And how long did you steep for? Hi Christy, remove from the heat when it starts scalding and then steep for 5 minutes. Sorry, must’ve missed that step but it’s added now! Hope you enjoy it! 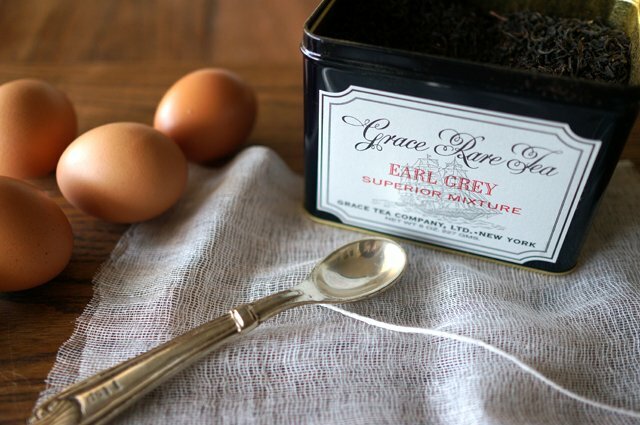 I’ve fallen in love with earl grey tea not too long ago and I’m so going to try this! I am salivating!!!! Thank you for bringing this information to my attention. I have a weekend activity now! 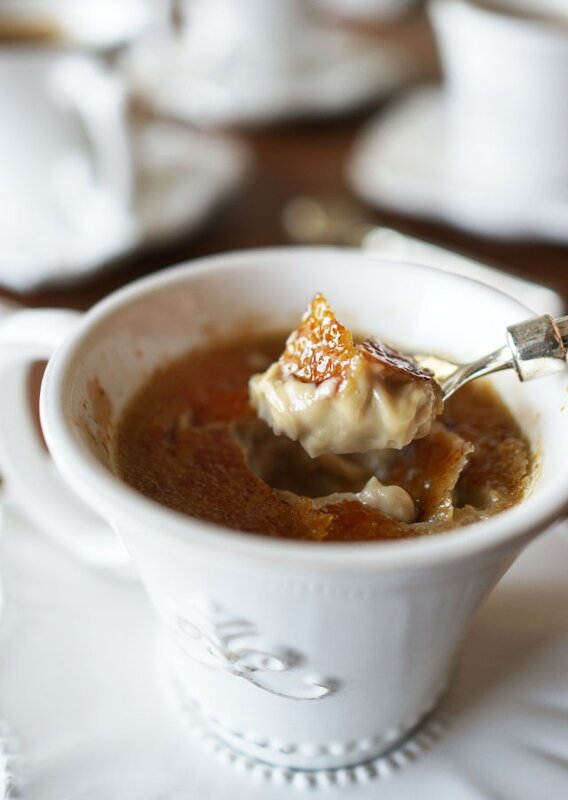 I love that these tea scented creme brulees are served in tea cups. I think that’s such a sweet idea, great for any daytime event, I think! What a great spin! Great blog! The best part is cracking the sugar crusted top! WOW, these look amazing. I’m going to have to make them. 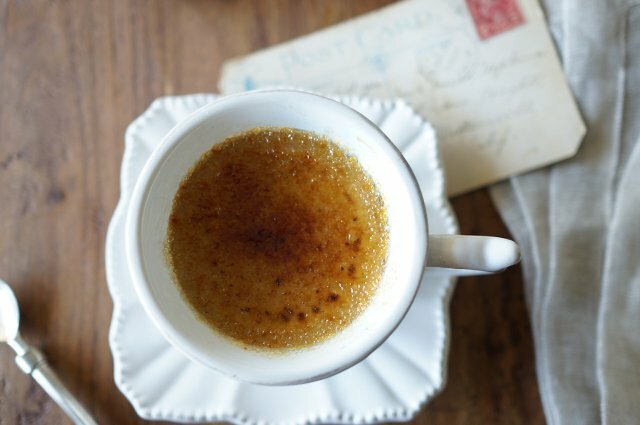 Creme Brulee is one of my all time fave desserts and Earl Grey is what I drink every morning so naturally this seems like the perfect dessert for me. SO excited to make these.